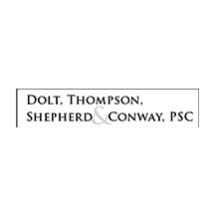 At Dolt Thompson, Shepherd & Conway, PSC, in Louisville, Kentucky, the attorneys in our law firm practice only personal injury law. Why? Because we understand that when someone suffers a serious injury as a consequence of someone else's negligence or misconduct, his or her life turns upside down. Our law firm's attorneys have therefore dedicated themselves to aggressively pursuing the highest amount of compensation possible for our injured clients, not only in Louisville but also throughout the state. We are proud of the fact that a high percentage of our clients come to us by way of a referral from their own attorneys who focus on noninjury areas of the law. This shows our clients that the reputation we have established over the past 30-plus years for our commitment, understanding, compassion and excellent results on behalf of our clients is one they can trust. In addition, our law firm's attorneys are highly skilled and experienced in FELA litigation on behalf of injured railroad workers. Dolt, Thompson, and Shepherd, P.S.C. Dolt, Thompson, Shepherd & Kinney, P.S.C.